Easy difficulty. Small bluffs with a waterfall will be on one side and the Red Cedar River on the other side. Bald eagles frequently sighted. 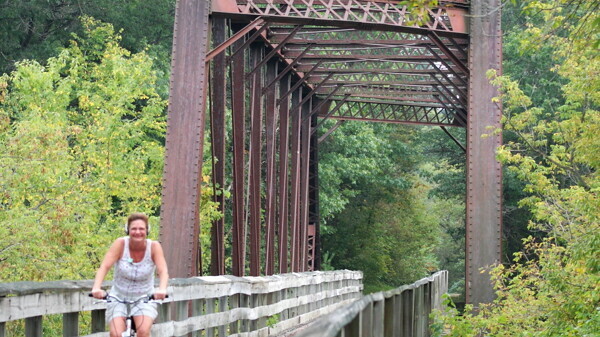 Going other direction from Dunnville takes you through the Dunnville State Wildlife Area across a trestle near the confluence of the Chippewa River and the Red Cedar River. This meets up with the Chippewa River Trail. From Downsville, take Cty Rd C east a few miles to Cty Rd Y. Go south until you reach the Red Cedar River. Park in boat landing lot across the river from the trail. Most of the entire Red Cedar Trail is scenic. Parking lots are located in Downsville, Irvington, and Menomonie. Check Out Menomonie is a slice of Volume One Magazine that is dedicated to the culture, entertainment, events, and restaurants in Menomonie.